The MK-48 is designed to combat fast, deep-diving nuclear submarines and high performance surface ships. It is carried by all Navy submarines. 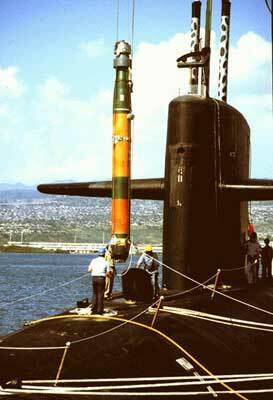 The improved version, MK-48 ADCAP, is carried by attack submarines, the Ohio class ballistic missile submarines and will be carried by the Seawolf class attack submarines. The MK-48 replaced both the MK-37 and MK-14 torpedoes. The MK-48 has been operational in the U.S. Navy since 1972. MK-48 ADCAP became operational in 1988 and was approved for full production in 1989. Features: MK-48 and MK-48 ADCAP torpedoes can operate with or without wire guidance and use active and/or passive homing. When launched they execute programmed target search, acquisition and attack procedures. Both can conduct multiple reattacks if they miss the target.